I left my local produce market the other day with no less than ten pounds of apples. Apples for eating, loads of home-made applesauce, maybe a galette or two, and yes, apple fritters. My day could only have been better if I had picked the pretty little gems myself. I toted them home, barely even minding all the extra weight the apples added to my bag. When I lived in New England, my very favorite part of Fall was going to an apple orchard. Every year, I’d go and eat far too many apples fresh off the trees, pick even more to take home, and drink hot apple cider. One of the best parts of going to the orchard was standing in line waiting for a paper bag full of piping hot cider donuts that we’d take out to a picnic table and devour while they were still hot enough to burn our fingers. They were perfectly cider-y and tossed generously in cinnamon sugar. I often miss New England, but Autumn is when I most find my mind wandering to the place I used to live. The crisp air, the brilliant foliage and the smell of wood burning fireplaces on the wind–it felt energizing and comforting all at once. I’ve not been to an orchard in years, but I’m grateful that here in England there are always ample varieties of gorgeous apples for all the autumnal baking I can dream up. I’ve loved using all sorts of new varieties in my baking. 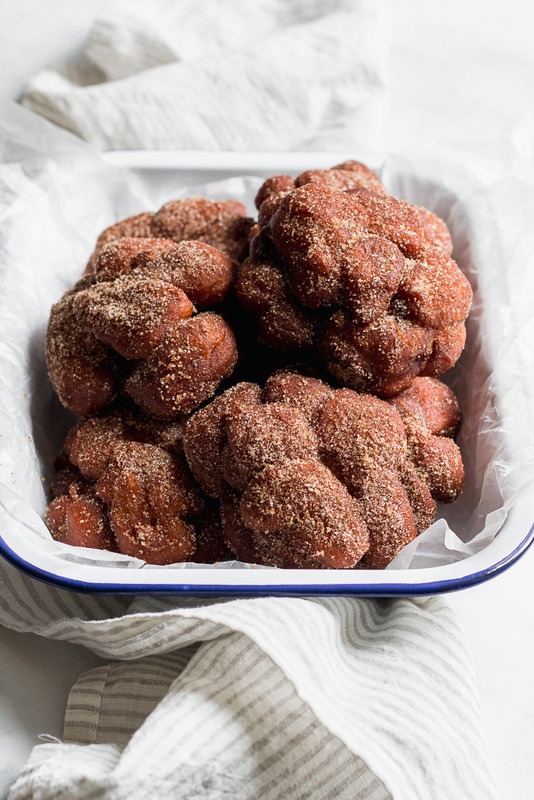 When I made these apple fritters, I used some British apples that hold up well in baking. In the recipe below, I’ve called for a granny smith and a pink lady or honeycrisp. These varieties are widely available, hold their shape when cooked, and both have loads of flavor that won’t be drowned out by the sugar. 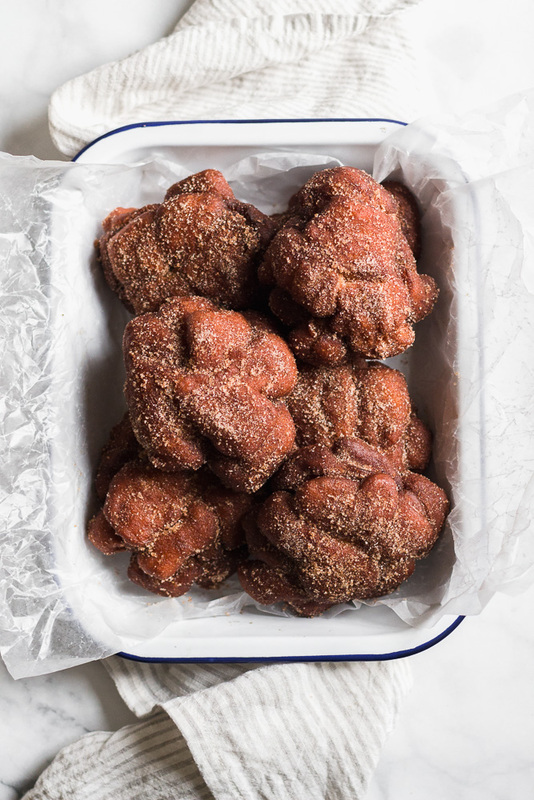 These apple fritters are an ode to my days in New England and all those cider donuts I ate every Fall. They’re warm and filled with chunks of perfect apples coated in caramel-y goodness. I hope they bring that lovely feeling of autumn to your kitchen. 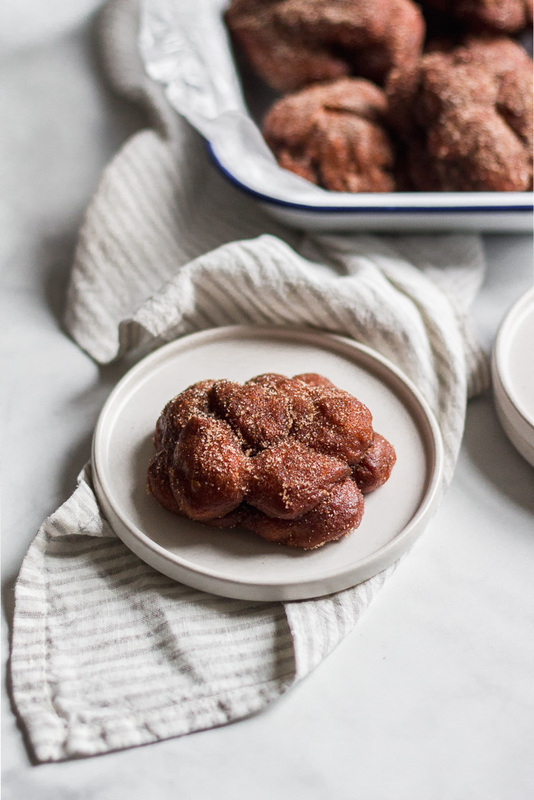 These apple fritters are the perfect ode to fall. 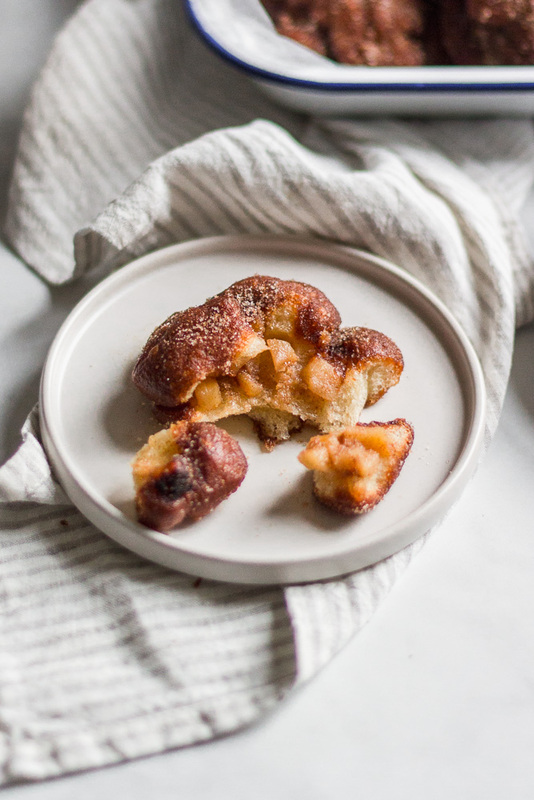 Perfect, warm donuts, filled with caramel-y tart apples and tossed in cinnamon sugar goodness! 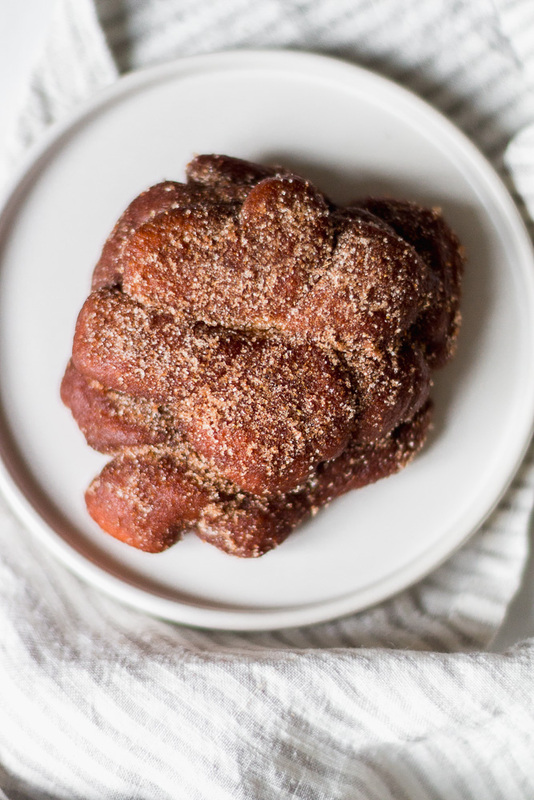 The night before you want to make apple fritters, make the dough. In a bowl of a stand mixer, fitted with a bread hook, whisk together the flour, sugar, yeast, salt, and cinnamon. In a 2 cup measuring cup, combine the milk, water, and butter. With the mixer on low, slowly add the liquid mixture. Mix until combined. Add in the eggs, scraping down the sides of the bowl first. Turn the mixer to medium speed and mix until the dough begins to come together and pulls away from the sides of the bowl. It's a really sticky dough, but it will begin to hold together in sticky ball in about 7, or so, minutes. Place the dough in a large, well-oiled, mixing bowl. Cover tightly with plastic wrap and place in the fridge overnight. In the morning, take the dough out of the fridge (it should be at least doubled in size) and place it in a draft-free place so that it comes to room temperature. This should be done about an hour before you want to shape the fritters. While the dough comes to room temperature, make the apple filling. Melt the butter in a non-stick skillet over medium-low heat. Add the chunks of apple and sauce until softened, about 3-4 minutes. Add in the lemon juice, brown sugar, kosher salt and cinnamon. Cook for about 1-2 more minutes until the sugar has dissolved and you've got a caramel-y sauce enveloping the apples. Let cool. Coat a rimmed baking sheet with oil. When the dough has come to room temp, punch it down, but gently. Lightly sprinkle a clean work surface with flour and place the dough on it. With your fingers, gently press the dough out into a rough rectangle until it's about 3/4 of an inch thick. Using a bench scraper (or a pizza wheel works pretty well! ), cut your rectangle into roughly 10 equal portions. Then cut each of those 10 portions into about 8-10 smaller bits. To shape each fritter, start with one portion of dough. Press 5-6 pieces of the portion together with your fingers. Kind of like you're trying to make a rough shape of a flour with the bits--a piece in the middle and pieces all around the center and all their edges pressed together. Top this with a spoonful of the apple mixture. Top the apple mixture with the remaining 4-5 pieces of dough, making sure that each piece of dough is pressed securely into the bottom bits of dough. Move this fritter to the oiled baking sheet. Repeat this process 9 times. Cover the shaped fritters loosely with plastic wrap and let rise for about 30 minutes--until they look puffy and soft. While they rise, prep your fry station. Fill a heavy bottomed dutch oven with 3 inches of vegetable or safflower oil. Heat the oil until a thermometer reads 350 degrees Fahrenheit. While the oil heats, line a rimmed baking sheet with a few layers of paper towels and place a cooling rack on top. In a large shallow pan or bowl, toss together the cinnamon and sugar for the coating. Toss the fritters, in batches, in the cinnamon sugar coating. Serve while still warm. Enjoy! *controlling the temperature of your oil is important. Adjust your temperature control as needed so that the oil never drops below 325 degrees Fahrenheit and never goes above 375 degrees Fahrenheit. Oh my goodness these look amazing! I really need to face my fear of yeast and make these.